It’s been almost two months since the Alisal School Board voted to name a new elementary school after Tiburcio Vásquez and, rather than dying down, outrage over the choice (fanned by headlines like “Officials Defend Decision to Name School After Murderer”) only seems to be growing. Concerned commentators and citizens declare themselves saddened and perplexed that school officials would hold out a gangster and criminal as a role-model for Alisal’s overwhelmingly Latino children. There are even attempts being made to strip the Alisal School Board (democratically elected by the Alisal community) of their power to determine the name. Rarely have so many in Monterey County demonstrated so little ability to view an historic figure from any perspective other than their own. From a British perspective, George Washington was a murderous criminal who committed treason against King and Country. And it’s undeniably true. Washington broke the law, he killed people, and he clearly committed treason. But from an American perspective, he’s not only a hero, he’s our country’s all-time greatest hero, and we’re proud to name innumerable elementary schools after him. Tiburcio Vásquez, from an Anglo perspective, was (and remains for many) nothing more than a murderous outlaw. And it’s undeniably true. Vásquez and his friends did rob and kill people. 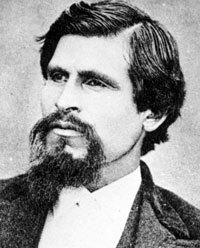 But from a Californio perspective, Vásquez was, and remains, a hero for giving Anglo society a badly needed taste of its own medicine. Vásquez lived at a time when intensely racist Anglo Californians were actively stealing millions of acres of Californio land (including from Vásquez’s own family) and murdering innocent Californios with impunity. Against this backdrop, it shouldn’t be hard to see why this cultured and articulate son of a well-respected family, who not only spoke out against the injustices being suffered by his people, but repaid Anglo lawlessness in kind, is considered a hero. His ritualistic execution, and the dignity with which he faced his death (following what was widely recognized, even at the time, as nothing more than a show trial), only enhances his status as a martyr to the cause of Latino rights. Anglo-Americans, we think, would be better off re-examining their own heroes than attacking those of others. As long as there are hundreds of elementary schools in the country named after people like Andrew Jackson – who owned slaves and killed thousands of Native people through his ethnic cleansing campaigns – Anglos are in a poor position to criticize the Alisal School Board for naming a school after Tiburcio Vásquez. This entry was posted on Sunday, February 3rd, 2013 at 10:35 am and is filed under History, Politics. You can follow any responses to this entry through the RSS 2.0 feed. You can leave a response, or trackback from your own site. well-spoken Xasauan! Hypocritical thinking is easily picked up by our children/students and lends itself in them to even less respect for the sanctimonious adults involved in this heated debate. this is America, not Mexico. We need to follow American rules and laws. He falls in the bucket of, violates that reasoning. Yes. And American rules and laws dictate that the people of Alisal get to elect a School Board and that School Board gets to decide what to name their schools. By all means let us not fall in the bucket of violating that reasoning. Vásquez contributed little to society or his community. George Washington contributed much more. Either way, it’s cleat that the media and school district are just trying to stir up local racial tensions. They were either trying to appease the booming Mexican community that thinks they are reclaiming California, or trying to stir up racial tension.No two sets of people love to create controversy more than elected officials and news reporters. In reality, everyone in this area is too scared to openly discuss cultural differences anyway. The “Mexican” community is not trying to reclaim anything, when it comes to California. “They” never really were not here. It might be true that the Alisal School Board was intentionally provocative. But so what? The ignorant and incendiary response makes it obvious that such issues need to be provoked if they are to be discussed at all. It’s somewhat non-sensical to claim that “people around here” are too scared or pc to have an open discussion about cultural issues while ringing hands over what is, in fact, an open discussion about cultural differences. Alisal School District includes Fremont Elementary School, so why not? However it would also be nice to see some school names dedicated to Native People such as the Ohlone or perhaps even the Esselen that were displaced. What Adam says, yes. Ohlone, Esselen, Miwok, Chumash, etc. We should honor the names of these people who suffered first by the Spanish taking their lands and forcing the loss of their homeland and culture. Pomponio State Beach is named for one such Miwok “bandit.” Pomponio was second generation mission indian, raised within the Mission Dolores system, who carried out “crimes” against the settlers for the same reasons as Vasquez and Murrietta. It does seem only fair that all local communities get to pick names for their schools whatever they might choose. Personally, I wouldn’t care to name my local school after Jefferson Davis or Robert E. Lee, but there are a lot of folks out there who have done so over the years. People have different perspectives on things!